Dave Min announces candidacy for California State Senate District 37. Irvine, Calif.— Dave Min, a UC Irvine law professor and economic policy expert, announced his candidacy for California’s 37th State Senate District, which is currently held by Donald Trump supporter John Moorlach. Min’s campaign has already garnered the endorsements of elected officials and activist leaders from across Southern California, ranging from Congressional Representatives to community leaders. Min is a University of California Irvine Law Professor, father of three, and a former economic policy staffer in the United States Senate and for the Center for American Progress. Min began his legal career at the Securities and Exchange Commission to protect the retirement security of seniors, turning down high paying jobs to serve the public interest. He is a leading expert on banking and housing policy. 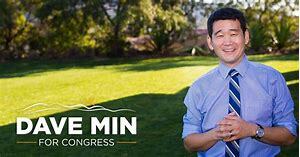 Additional information about Dave Min and his campaign is available here. Voicemail or Text @ (949) 423-6468.